Iran, Nov. 30, 2018 - These days, we’re witnessing a multitude of crises throughout Iran. These different events are gradually joining one another and becoming a very strong movement, a movement that can cause fundamental change. In a country that has been enchained in tyranny and poverty for decades, any of these crises can play the role of a spark on a powder keg. 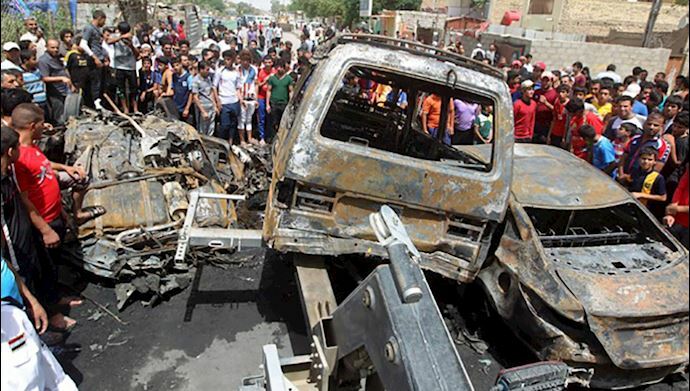 The workers of Haft Tapeh and Ahvaz in Khuzestan province have been protesting for their most basic rights for several weeks. At the same time, the farmers of Isfahan have been protesting for their rights to water for several months. 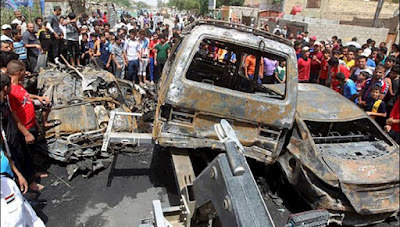 The tension between the farmers and the Iranian regime has become so intense that it has led to clashes between the protesting farmers and security forces on several occasions. In Tehran, government employees and retired government workers intermittently protest in front of the Iranian regime’s parliament for their rights. Whereas, teachers of hundreds of schools in dozens of cities have gone on repeated strikes demanding pay raise, job security and the release of their imprisoned colleagues. Meanwhile, the privatization of Iran’s hospitals has caused its own set of problems and has negatively impacted the livelihoods of hospital workers, who gather for demonstrations every once in a while. At a broader scale, the privatization of government institutions has caused deep problems in different parts of the country, and those problems are manifesting themselves in demonstrations in different cities. Haft Tapeh is just a sample of this deep-rooted crisis of the Iranian regime. In Kermanshah province, west of Iran, the victims of last year’s devastating earthquake are still living in the desert with only tents and frail trailers as protection against the weather. And now, a new earthquake has hit the same region, driving even more people into misery. Meanwhile, the regime has neglected the plight of the people of Kermanshah and has failed to provide them with the minimum facilities and aid to overcome their ordeal. The IRGC-linked financial institutions are another part of this multipronged economic crisis. The clients of these institutions, who have been robbed of their wealth, are protesting across Iran to claim back their investments that have been spent on the Revolutionary Guards ventures beyond Iran’s borders, filling the coffers of Lebanon’s Hezbollah, the Houthis in Yemen and the Badr Corps in Iraq. In southeast of the country, the poor people of Baluchistan are bearing the violence of IRGC forces. Every week, news of several murders of Baluch citizens by the Revolutionary Guards finds its way into social media channels. The people of Baluchistan, fed up with the tyranny and oppression of the Iranian regime, are becoming bolder in confronting security forces. Teachers, drivers, railroad workers, and many other Iranian citizens are engaged in a total struggle with a regime that has at times failed to pay their wages for more than 11 months. They have taken to the streets to reclaim their most basic rights. At the same time, these crises have found their way into the ranks of the regime and the power hierarchy. The different factions within the Iranian regime are constantly confronting and blaming each other for the country’s economic problems. Recently, a group of parliament members put forth the demand to impeach Ali Larijani, the speaker of the parliament. The slogans and demands of different groups of protesters are saying are very similar and hint at an impending major confrontation between the people of Iran and the ruling regime. In a message that was widely distributed on social media, one of the farmers of Isfahan who have been protesting over their rights to water said: “I’m a farmer from east Isfahan. Why aren’t you talking about the plight of the injustice you’ve done to the thousands of families who used to live in comfort but are now struggling to make ends meet? 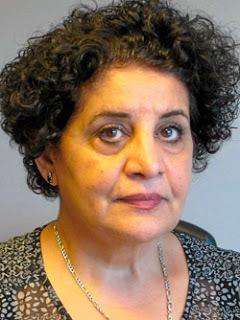 “I myself was arrested and sent to solitary confinement because I had protested for my right to water. My sight was damaged because of the beatings of security forces. Three of my teeth were broken. While I was in a critical condition, they gagged me, blindfolded me and tied my hands and feet and abandoned me in front of the Khourasgan hospital. During the protests of Khuzestan, one of the women who joined the protesters in solidarity said, “If they don’t listen to our demands, I will take my demands straight to Khamenei!” This video was widely distributed in social media channels. Since last December, uprisings and protests flared across Iran and have turned into a wildfire that is engulfing the entire regime. National unity and solidarity is bringing Iranians closer together toward fulfilling their long-held dream of overthrowing the tyrannical regime of the mullahs and establishing freedom in their beloved country. 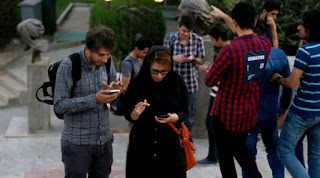 Earlier this year, the Iranian regime made the decision to ban Telegram – the most popular messaging service in Iran with more than 42 million regular users. The hardliners ordered internet service providers to block access to the messaging service on 30th April. Telegram has been an important tool for the people of Iran and during the election process last year when President Hassan Rouhani was re-elected for a second term its usage was widespread across the country. 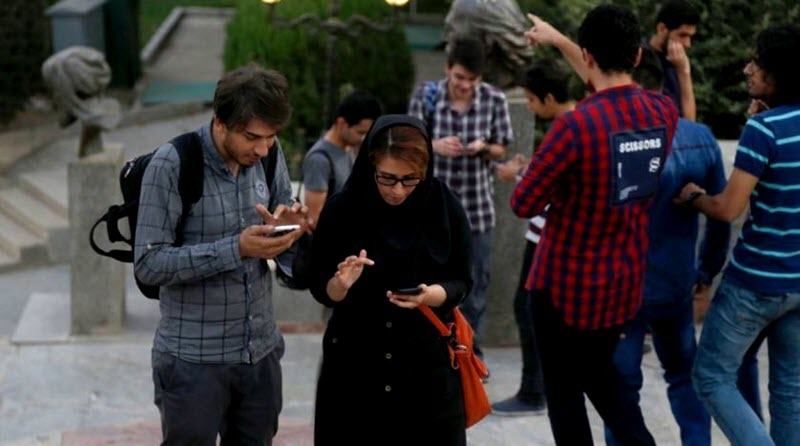 The Iranian regime explained that the judiciary banned the application because of the sheer number of lawsuits against Telegram. An Iranian official said that they had contacted Telegram to provide the regime with details about “offenders” but they did not get the information they wanted. Amoli Larijani said the week after the ban was imposed that Telegram is being used for nefarious purposes. 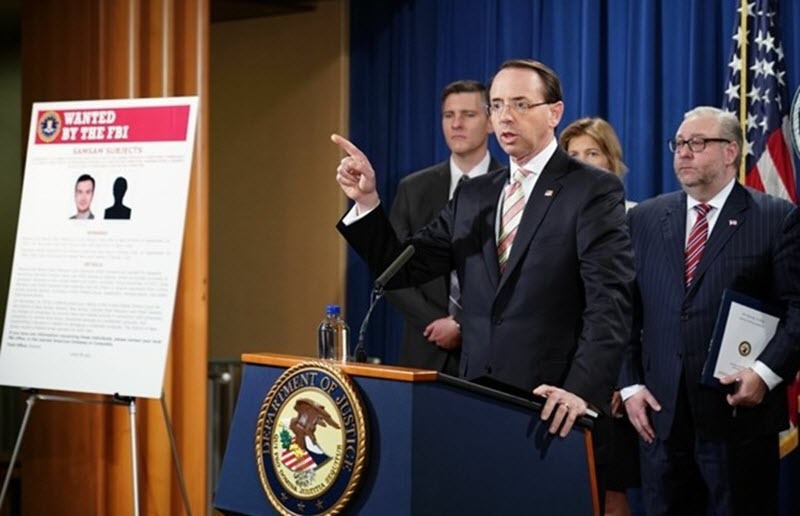 He said: “That a messaging [application] becomes a safe haven for criminal acts and individuals [to] commit any criminal offense, from frauds to crimes against the reputation of persons and terrorist acts, is not acceptable for any country. Is it reasonable and logical to accept that a person, while offering some services in a physical and realistic way, turns that place into a safe haven for criminals? Cyberspace has exactly the same status." Telegram has been banned several times in the past few years, but the tech-savvy people of Iran have been able to get around the ban, very easily, by using proxies. This time, the judiciary instructed internet service providers to make sure that the people cannot bypass the ban by using proxy tools. However, this was not effective because the people are still able to find ways to use the application. The regime urged the people to give up on the idea of using Telegram and presented an equivalent. However, the people were not interested in the regime’s applications. They know that they will be used to spy on the people so they refuse to open themselves up to further oppression and suppression. The ban is also being undermined by news agencies – both hardliner and conservative ones, including Tasnim News Agency and Fars. 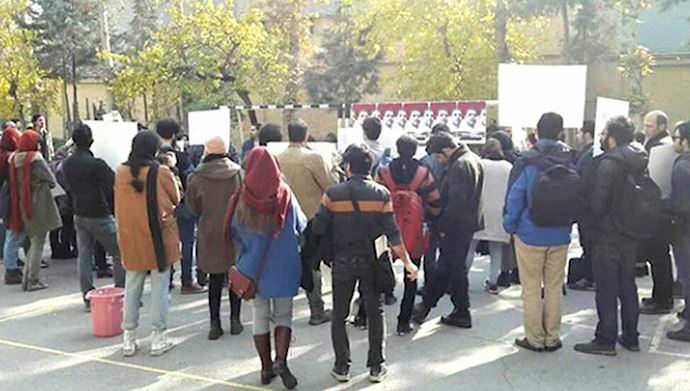 Oppression in Iran is continuing despite the widespread discontent for this very reason. 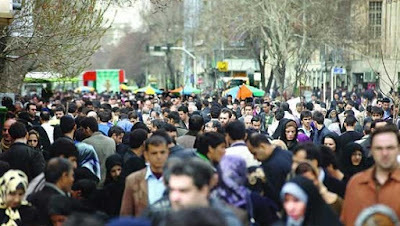 The people of Iran have been taking to the streets in protest against many different problems for almost a year and the situation threatens to explode at any second. To counter, or at least to try and control the situation, the Iranian regime is carrying out mass arrests of protesters. However, this is not dissuading the people from voicing their dissent. In fact, it is making them more determined. The people of Iran want regime change because they know it is the only way in which they will ever experience freedom, democracy and human rights in their country. They support the U.S. sanctions that are crippling the economy because they know that the regime needs cut off from the funds that it uses to spread chaos across the Middle East. 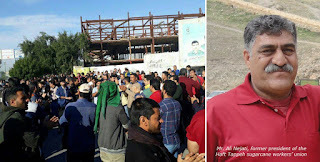 The Iranian regime, furious and aggravated by the strike and demonstrations of courageous workers of the Haft Tappeh sugar cane mill, on Thursday November 29 arrested Mr. Ali Nejati, former president of the Haft Tappeh sugarcane workers’ union, along with his son, and transferred them to an unknown location. The repressive forces arrested and beat him while he was suffering from heart disease and was badly ill. Despite these arrests and the presence of suppressive forces in the city of Shush, the brave workers of Haft Tappeh sugar cane mill continued their protest for the 25th day. 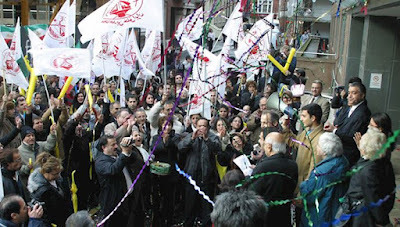 They chanted in the gathering in front of the regime's governorate: Imprisoned worker must be freed. On the other hand, the governor, the regime’s MP and the head of the Revolutionary Guards went to the area to force the workers to end the strike by giving deceptive promises. But they were faced with a negative response from the workers. Workers interrupted the speech of the member of the regime's parliament by chanting slogans. The Iranian Resistance calls on the UN High Commissioner for Human Rights, the International Labor Organization, trade unions and labor unions all over the world to take urgent action to free Ali Nejati and other detained workers and to support striking workers. برچسب تروریستی علیه نیروی اصلی اپوزیسیون ایران و سرکوبهای ناشی از آن، برجسته‌ترین وجه سیاست مماشات با فاشیسم مذهبی و بزرگترین مانع تغییر دموکراتیک در ایران بوده است. هیچ عاملی باندازه گنجاندن اپوزیسیون مشروع رژیم آخوندی در لیستهای تروریستی، در خدمت بقای این رژیم و علیه تغییر دموکراتیک در ایران نبوده است. آن نامگذاری گویای این بود که مماشاتگران با ملایان، هرگز توان درک پتانسیل آزادیخواهی در تاریخ ایران و نیز استعداد تشخیص تضاد اصلی در ایران را نداشته‌اند. بر هم زدن آن لیست‌گذاری، مبین حیات سیاسی مستقل مقاومت ایران در جهانی تک‌قطبی است. روز ۹آذر ۱۳۸۶ دادگاه انگلستان با صدور حکمی برچسب تروریستی علیه سازمان مجاهدین خلق ایران را باطل کرد و به وزیر کشور دستور داد حذف نام سازمان مجاهدین خلق ایران از فهرست سازمانهای ممنوعه را به پارلمان انگلستان ارائه کند. کمیسیون استیناف سازمانهای ممنوعه(پوئک) در حکم خود بر بطلان و نامگذاری تروریستی تأکید کرد و به دولت انگلستان دستور داد رفع ممنوعیت از سازمان مجاهدین خلق ایران را به مورد اجرا بگذارد. معادله‌ای چندمجهوله باید حل می‌شد تا گره‌های این تور جهانی، بندبند باز می‌گشت. آن نامگذاری مبین این واقعیت بود که سیاست از منظر منافع تجاری و اقتصادی، مغلوب سیرک‌های هر چند مدت یک‌بار ولایت فقیه بوده است و آثار آن هنوز هم ادامه دارد. امدادهایی که با این تجارت سیاسی و اقتصادی روانهٔ دستگاه سرکوب و جنایت ملایان شد، از بی‌نظیرترین حمایت‌های قدرتهای جهانی به یک حکومت ارتجاعی در قرن ۲۰ و ۲دهه قرن ۲۱میلادی بوده است. برهم‌زدن آن لیست‌گذاری، مبین حیات سیاسی مستقل مقاومت ایران در جهانی تک‌قطبی است. زدودن آن برچسب استعماری ـ ارتجاعی از جانب یک نیروی غیرحاکم در مواجهه با انواع دیوارها و زنجیرهای مریی و نامریی در سراسر جهان، تلاشی نفس‌گیر می‌طلبید. مقاومت ایران با حفظ هویت و استقلال خویش و با مبارزه بی‌امان سیاسی و حقوقی توانست آن تور بزرگ و سنگین را از هم بدرد و مهم‌تر آن‌که مماشات آمریکا و اروپا را توأم با افشای پشت‌پرده‌های زدوبندشان با نظام ولایت فقیه افشا ‌کرد. پادزهر سیاست مماشات و قدرتی که می‌بایست آن تور سنگین ارتجاع و استعمار را بندبند می‌گشود، یک امید صیقل خورده در وفای به پیمان با آزادی در تاریخ ایران می‌طلبید. این امید و وفای به پیمان، همان بارقه‌ای است که در کسوت تشکیلات مستقل مجاهدین خلق و مقاومت ایران توانست در مواجهه با برچسب تروریستی و شکست دادن آن، سند درخشانی بر مبارزات مردم ایران بیافزاید. با این سرمایه و گنجینهٔ ملی و میهنی بود که مقاومت ایران سراغ وجدانهای آغشته نشده به سیاست مماشات و تجارت با ملایان در اروپا و آمریکا و دیگر کشورها رفت. ــ گره‌های محکم و سخت تور سنگین تهمت و افترای ساختهٔ ملایان و خریدارانش در اروپا و آمریکا، سال‌های سال با کاروانی از حقوق‌دانان و وجدانهای بیدار سیاسی و با تکاپوی خستگی‌ناپذیر اعضا و اجزای مقاومت ایران، مرحله‌به‌مرحله و بند‌به‌بند با درایت و رهبری مریم رجوی گشوده شدند و حاصل آن: اعتراف به اصالت مقاومت برابر دیکتاتوری آخوندی و به‌رسمیت شناختن حق مبارزه برای سرنگونی آن‌. اکنون به بازخوانی آن تحول و اخبار ناشی از آن می‌پردازیم؛ اما حقیقتاً باور تحقق آن در جهان صلب و سخت منافع سیاسی و آلوده‌شده به تارهای به‌هم‌تنیدهٔ مماشات همراه با انبوه موانع دست‌وپاگیر بوروکراتیک، غیرممکن می‌نمود. از این‌رو آنچه در شکست‌دادن برچسب تروریستی اتحادیه اروپا در آذر ۱۳۸۶ و ۵سال بعد در خروج از لیست وزارت‌خارجه آمریکا در ۷مهر ۱۳۹۱ روی داد، به‌راستی که به‌سان رویاندن بنفشه‌ای از دل مفرغ و سنگ بود. «۷سال پس از نامگذاری تروریستی و ”ممنوعه“ شدن سازمان مجاهدین خلق ایران در انگلستان، امروز کمیسیون استیناف سازمانهای ممنوعه(پوئک) پس از رسیدگی طولانی به این پرونده، صراحتاً در حکم خود بطلان و غیرقانونی بودن برچسب تروریستی را اعلام کرد. خانم مریم رجوی، رئیس‌جمهور برگزیده شورای ملی مقاومت ایران، حکم امروز دادگاه را پیروزی درخشان عدالت، اذعان به حقانیت مقاومت ایران و سازمان مجاهدین خلق ایران، نشان برانگیختگی وجدان بین‌المللی و پیام قاطعیت جامعه جهانی در برابر فاشیسم مذهبی توصیف کرد. خانم مریم رجوی این پیروزی تاریخی را به سازمان مجاهدین، به رزم‌آوران اشرف و عموم مردم ایران و همه دوستداران عدالت و آزادی تبریک گفت و آن را پیروزی ارزشهای انسانی و دست‌آوردهای بشری از جمله به‌رسمیت شناختن حق مقاومت برای آزادی دانست. رئیس‌جمهور برگزیده مقاومت، ۳۵عضو مجلس عوام و اعیان انگلستان که ممنوعیت مجاهدین را به چالش کشیدند، وجدان بیدار مردم انگلستان نامید که بر بی‌عدالتی بزرگی که در حق مردم و مقاومت ایران روا شده بود، برشوریدند، خانم مریم رجوی با گرامی‌داشت خاطره لرد رنتون فقید از شاکیان این پرونده و همه نمایندگان و حقوقدانان و وکلا و شاهدانی که طی سالیان برای حذف این ممنوعیت تلاش کردند، قدرانی و تشکر کرد. رئیس‌جمهور مقاومت قضات شریفی را که به‌ دور از تاثیرات سیاست مماشات و به‌رغم همه کارشکنی‌ها و فشارها، بر اساس وجدان قضایی و انسانی خود جانب عدالت را گرفتند، ستود و خاطرنشان کرد حکم امروز بر این واقعیت که این ممنوعیت از ابتدا یک تصمیم سیاسی و به‌خاطر خوش‌آمد ملایان بوده است، صحه می‌گذارد. خانم رجوی از دولت انگلستان خواست به‌ دور از هر گونه تعلل و تأخیر حکم دادگاه را بپذیرد و به اجرا در بیاورد و همهٔ محدودیتهای ناشی از این ممنوعیت را برطرف کند. خانم مریم رجوی یادآوری کرد: در یک دهه گذشته هیچ عاملی به‌اندازه گنجاندن اپوزیسیون مشروع رژیم آخوندی در لیستهای تروریستی، در خدمت بقای این رژیم و علیه تغییر دموکراتیک در ایران نبوده است و افزود هم‌چنان‌که در جلسات استماع در دادگاه و در اسنادی که دولت انگلستان به دادگاه ارائه داد برملا شد، بمباران قرارگاههای مجاهدین در جریان جنگ عراق که منجر به‌ شهادت دهها تن از مجاهدین گردید، به‌ درخواست استبداد مذهبی حاکم بر ایران و به بهانه همین نامگذاری صورت گرفته است. خانم رجوی افزود، پس از رأی امروز، اتحادیه اروپا باید بلادرنگ برچسب غیرقانونی تروریستی علیه مجاهدین را ملغی سازد زیرا پایه و مبنای آن برچسب، نامگذاری مجاهدین توسط وزارت کشور انگلیس بوده و دادگاه عدالت اروپا نیز به لغو آن رأی داده است. رئیس‌جمهور برگزیده مقاومت با یادآوری این‌که برچسب تروریستی علیه نیروی اصلی اپوزیسیون ایران و سرکوبهای ناشی از آن، برجسته‌ترین وجه سیاست مماشات با فاشیسم مذهبی و بزرگترین مانع تغییر دموکراتیک در ایران بوده است، گفت: تجربه طولانی ثابت کرد که سیاست‌های ”جستجوی مدره“، ”دیالوگ سازنده“، ”دیالوگ انتقادی“ و ”ارائه مشوق“ به فاشیسم مذهبی، نتیجه‌ای جز فرصت‌دادن و جری‌تر کردن آن ندارد. زمان آن فرارسیده است که هر گونه مماشات و سازش و تسلیم در برابر فاشیسم مذهبی که اکنون با سرپوش ”صلح‌خواهی“ توجیه می‌شود، برای همیشه به‌ دور انداخته شود. قاطعیت تنها راه مقابله با رژیمی است که با تمام قوا برای دستیابی به بمب اتمی تلاش می‌کند و به ضرب انتگریسم و صدور تروریسم به‌دنبال کسب هژمونی و ”پرکردن خلأ قدرت“ در عراق و افغانستان و لبنان و فلسطین و یمن و سومالی است. رژیم جنگ‌افروزی که برد موشکهایش را برای رسیدن به کشورهای اروپایی نیز افزایش داده و بی‌گمان منطقه و جهان را در معرض فاجعه قرار داده است. خانم رجوی تأکید کرد، پیوسته گفته‌ایم که راه‌حل بنیادین مسأله ایران نه جنگ و لشکرکشی خارجی و نه سازش و مماشات بلکه تغییر دموکراتیک به‌وسیله مردم و مقاومت ایران است که برداشتن راهبندها را از پیش پای این مقاومت ایجاب می‌کند». روزنامه انگلیسی دیلی‌تلگراف گزارش کرد: قاسم سلیمانی، سرکرده نیروی تروریستی قدس سپاه پاسداران رژیم ایران، برای ساکت کردن منتقدان این رژیم، در عراق تیم‌های ترور از مزدورانش را مستقر کرده است. این روزنامه گزارشی از اقدامات رژیم برای ترور نزدیکان آیت‌الله سیستانی، مقتدی صدر و حیدرالعبادی منتشر کرد. دیلی تلگراف گزارش کرد: «تیم‌های ترور رژیم ایران در ماه آگوست نیز سعی کردند راضی الطایی را ترور کنند ولی در این کار ناکام ماندند. راضی الطایی یک چهره نزدیک به آیت‌الله علی سیستانی، مرجع تقلید شیعیان عراق است که خواستار منع نفوذ رژیم ایران در دولت جدید عراق شده بود». به گزارش دیلی تلگراف برخی دیگر از مهم‌ترین قربانیان این تیم‌های ترور عادل شاکر التمیمی، هم‌پیمان نزدیک حیدرالعبادی، نخست‌وزیر سابق عراق و شوقی الحداد از شخصیت‌های نزدیک به مقتدی صدر هستند. بنا به این گزارش تیم‌های ترور رژیم آخوندی پس از انتخابات ماه مه ۲۰۱۸ عراق و پس از ناکامی کاندایداهای مورد حمایت رژیم ایران و شکست این رژیم در بسط سیطره خود در تشکیل دولت جدید عراق، در این کشور مستقر شدند. دیلی‌تلگراف به‌نقل از مسئولان امنیتی بریتانیا که مسئولیت حمایت و آموزش نیروهای نظامی عراق را برعهده‌ دارند، گزارش کرد رژیم ایران تعدادی از گروه‌های ترور سپاه قدس را به عراق فرستاده تا صداهای مخالفان را خفه کند. این تیم‌ها توانستند مخالفان ایران در جریانهای سیاسی عراق را مورد هدف قرار دهند. شوقی الحداد که از نزدیکان مقتدی صدر به‌شمار می‌رفت از جمله این قربانیان است. او در ماه ژوئیه و پس از آن‌که رژیم ایران را به تلاش برای تقلب در انتخابات عراق متهم کرد، کشته شد. نشریه سان سنتینل، ۲ آبان ۹۷ در مطلبی به قلم اریل کاهانا، پیرامون دخالتهای منطقه‌یی رژیم ایران در منطقه و تأمین مالی و تجهیز تسلیحاتی گروه‌های شبه‌نظامی وابسته‌اش در عراق از جمله نوشت، منابع اطلاعاتی کشف کرده‌اند که رژیم ایران در حال ایجاد کارخانه تولید موشک در عراق است و این علاوه بر تلاشهای آن در سوریه و لبنان می‌باشد. بنا‌ به گزارشات رسیده ایران پیشاپیش موشکها را به شبه‌نظامیان شیعی در عراق ارسال کرده و به عراق کمک کرده است تا کارخانه تولید آنها را در خاک عراق مستقر کند. گزارشات ماه گذشته فاش ساختند که سپاه پاسداران به شبه‌نظامیان حشدالشعبی موشکهای بالستیک با برد کوتاه داده است. تحولی که نشان می‌دهد عراق این پتانسیل را دارد که تهدیدات جدی نیابتی که از جانب رژیم ایران هدایت می‌شود را دنبال کند. گزارشات همچنین نشان دادند، به‌دنبال کشف یک توطئه سپاه پاسداران برای حمله به منافع آمریکا در عراق، آمریکا تصمیم گرفته است کنسولگریش را در بصره ببندد. بصره سومین شهر بزرگ عراق است. تلویزیون اسکای نیوز در برنامه‌ای ویژه قاچاق مواد مخدر به عراق، نقش سپاه پاسداران و نظارت رژیم ایران در اشاعه مواد مخدر در عراق را افشا کرد. اسکای نیوز به‌نقل از فرمانده پلیس استان بصره گفت مبدأ هشتاد درصد از مواد مخدری که وارد این استان می‌شود ایران است. امری که باعث شده پلیس استان دست به‌عملیات امنیتی بزند و تاجران مواد مخدر در بصره را دستگیر کند. انواع مختلفی از مواد مخدر به این استان وارد شده که برجسته‌ترین آنها ماده کریستال یا به زبان ایرانی شیشه بوده است. فرمانده پلیس بصره گفت ۴۹۰کیلومتر نوار مرزی ایران با استانهای جنوبی عراق است و پلیس با عملیات خود این نوار را حفاظت می‌کند. او گفت با صراحت تمام می‌گویم مواد مخدری که به بصره وارد می‌شود هشتاد درصد آن از ایران وارد می‌شود. به گفته پلیس بصره مواد مخدری که از ایران وارد عراق می‌شود در بسته‌های کفش و لباس جاسازی می‌شوند. بعد از کریستال، ماده ترامادول و حشیش نیز بیشترین حجم مواد مخدر وارد شده به عراق از ایران را شامل می‌شوند. اسکای نیوز افزود: مقامات عراقی در گذشته گفته بودند که در استان بصره مواد مخدر به‌وفور گسترش پیدا کرده پس از بصره در استانهای بغداد و میسان نیز این مواد به میزان زیادی وجود دارد که بیشتر توسط جوانان مصرف می‌شود. منابع در پلیس استان بصره فاش ساختند دستگیریها به اتهام خرید و فروش مواد مخدر از سال ۲۰۱۵افزایش یافته ولی عملیات مبارزه با گسترش مواد مخدر با موانع مختلفی روبه‌روست چرا که سپاه پاسداران ایران در قاچاق مواد مخدر از ایران و افغانستان به عراق دست دارد. در این رابطه عبدالقادر النائل کارشناس عراقی به اسکای نیوز گفت مقادیر زیادی مواد مخدر توسط تاجران وارد عراق می‌شود که پول آن به میلیاردها دلار می‌رسد. او اضافه کرد امروز سپاه پاسداران و رژیم ایران ارز مورد نیازشان را از طریق فروش مواد مخدر به‌دست می‌آورند و عراق را به مرکز انتقال مواد مخدر به مناطق مختلف جهان تبدیل کرده‌اند. این مربوط به مرزهای رسمی است ولی در سایر معابر مرزی که در کنترل دولت نیست با توجه به این‌که رژیم ایران شبه‌نظامیان وابسته به خودش را در عراق دارد توسط آنها مواد مخدر را قاچاق می‌کند. این کارشناس عراقی افزود: مردم عراق و افراد مطلع می‌دانند که قاچاق مواد مخدر در عراق تحت نظارت رژیم ایران است و زیر نظر سپاه پاسداران و با حمایت شبه‌نظامیان حشدالشعبی انجام می‌شود. این موضوع حتی به کشت مواد مخدر هم رسیده و در استانهای انبار و نینوی و منطقه جرف الصخر توسط این شبه‌نظامیان مواد مخدر کشت می‌شود. آنها نمی‌گذارند که اهالی این مناطق به آن باز گردند و شروع به کشت مواد مخدر در داخل عراق کرده‌اند. یعنی اگر در مرزها نتوانند این مواد را قاچاق کنند آنها را در داخل عراق کشت می‌کنند. امروز عراق به محلی برای انبار کردن مواد مخدر تبدیل شده است. در ارتباط با شبکه جهانی توزیع و خرید و فروش مواد مخدر رژیم ایران عبدالقادر نائل گفت: شما می‌دانید که عناصر حزب‌الله در کشورهای جهان به‌خاطر خرید و فروش مواد مخدر دستگیر شده‌اند. حوثی‌ها در یمن مواد مخدر خرید و فروش می‌کنند. امروز شبه‌نظامیان حشدالشعبی در داخل عراق این مواد را کشت می‌کنند. کسانی که شبه‌نظامیان حشدالشعبی‌ خانه هایشان را در روستای ساده در کوههای حمرین واقع در استان دیالی تصرف کرده‌اند گفتند که یک هفته پیش این شبه‌نظامیان در زمینهایشان مواد مخدر کاشته‌اند. آنها اجازه نمی‌دهند کسی وارد این روستا شود.